Picture from a Cambodia-Laos security meeting held earlier this year. What’s Next for the Cambodia-Laos Border Dispute? Both sides continue to try to resolve a thorny issue in their bilateral relationship. Last week, there was a flurry of activity in Cambodia-Laos relations tied to Cambodian Prime Minister Hun Sen’s anticipated visit to Laos. While both sides discussed a range of issues within their bilateral relationship, the interaction also once again put the focus on the outstanding border dispute between the two sides. As I have noted previously in these pages, Laos and Cambodia, two neighboring Southeast Asian states, share a 540-kilometer, partly demarcated land border, which has been a source of occasional disputes and differences. A case in point was in August 2017, when simmering border tensions yet again threatened to boil over into potential conflict and the situation was only de-escalated following intervention by the leaderships of both sides. Despite this reality, the two countries have nonetheless continued to hold exchanges to manage border issues, whether it be working through lingering differences over border surveys and demarcation or making progress on common challenges such as tackling cross-border crimes and facilitating communication between border facilities. That has continued on into 2018, particularly after Cambodian Prime Minister Hun Sen secured yet another term in office following elections (albeit after dismantling the opposition). 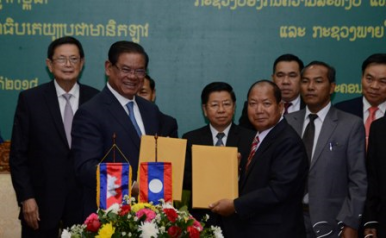 Hun Sen is now looking to stabilize Phnom Penh’s ties with neighboring states and key powers. Indeed, in September, reports had surfaced that Cambodia and Laos had forged a so-called “three-point resolution” to manage border tensions in Stung Trend province during a World Economic Forum (WEF) meeting held in Hanoi, which included withdrawing troops from disputed areas and holding joint patrols to combat criminal activities along the border. Last week, the border dispute surfaced yet again amid Hun Sen’s visit to Laos. While Hun Sen’s visit was wide-ranging, with meetings with top Lao officials including Prime Minister Thongloun Sisoulith and agreements reached on areas such as education, culture, and art, the border dispute unsurprisingly was a point that came up between the two sides. According to The Phnom Penh Post, Hun Sen said both sides remained committed to ending their border disputes, and cited the “three-point consensus” agreed upon earlier between the two leaderships as being: no armed forces being present; no business or trading activities; and all patrols being done together. While specifics still remain unclear on all three fronts, both sides have made references to this as a new status quo of sorts while they make progress on resolving disputes. Hun Sen also added that the Cambodian and Lao leaders had both agreed to entrust foreign ministers to draft and then send a request for maps to France. His comments were just the latest reference to the expressed need for France to provide documents to the two sides, including maps, to help them resolve their disputes; both sides were French colonies before they gained their independence. All in all, the latest Cambodia-Laos summit meeting illustrates that while both sides remain committed to resolving the border issue and that it continues to be a key priority, actual progress beyond efforts to preserve the status quo continues to be contingent upon specifics that will need some working out between them. Even as they continue to make inroads in other aspects of ties, this area will remain important to watch given its continued significance. Are Cambodia and Laos Really Any Closer to Resolving Their Border Dispute? Despite some incremental progress, deeper questions remain unresolved.